A while back Microsoft bought Yammer and since then has been working hard to integrate it into Office 365. If you have an Enterprise Office 365 plan you should now have the ability to enable this integration. Here’s a brief outline of how to complete this integration. 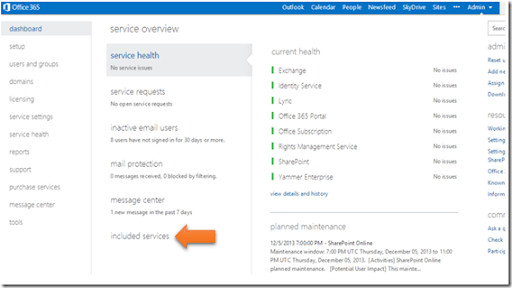 Login to your Office 365 portal as an administrator. At the bottom of the second column on this page you should see Included services. Select this. That will now display the above option to the right. Select the link – Yes, activate Yammer Enterprise for my network. You’ll then be taken to a screen where you can select which domain you wish to activate that on from the pull down list at the top of the screen. Then select the Activate Yammer Enterprise button below. The configuration will now commence. As noted this process could take 1 to 30 minutes to complete. Look out for future post of the Yammer integration with Office 365 as I think this is another HUGE opportunity with the product.